The best zucchini for eating — and consequently freezing — will not be overly-large. Go with squash that’s no more than 8-10 inches in length. Save your baseball bat-sized squash for stuffing. Or for playing a really messy game of baseball. To start, cut off the ends of the zucchini. Then cut the squash in half crosswise. Cut each half in half lengthwise. Then shred the squash. This will take only seconds if you have a food processor that’s outfitted with a shredding disk. The food processor is the best invention ever. If I ever become rich and famous, I’ll be able to offer 9-cup capacity Cuisinarts as giveaways on this site. Kinda like Oprah does with cars. Next, pour the shredded zucchini into a large bowl, and give it a sprinkling of coarse kosher salt. One teaspoon salt per pound of squash is about right. Toss the shredded mass with your hands so that the salt gets spread around. Then leave it unattended for at least 10 minutes. The salt will cause the squash to render its juices. 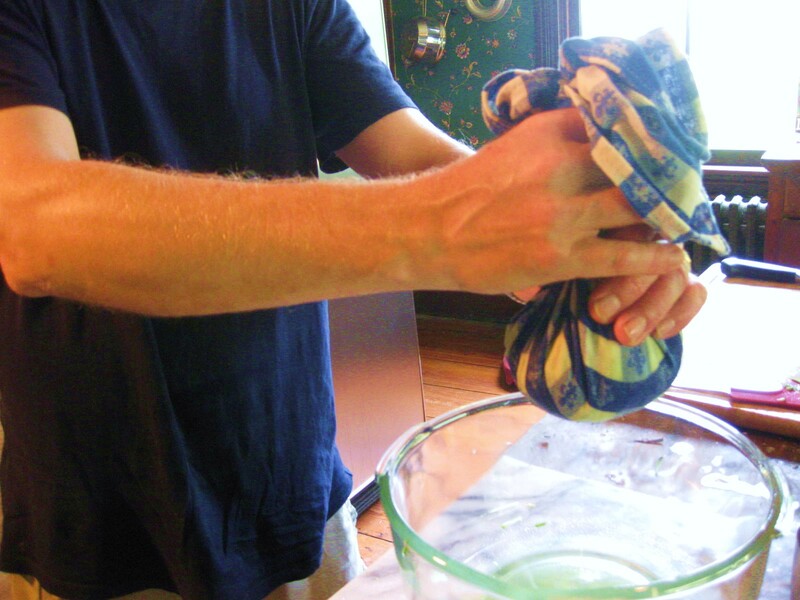 Now scoop up a big handful of squash, and plunk it down on an absolutely-clean kitchen towel. A blue and white towel decorated with fleur de lis will work best. Twist the towel over a bowl, and you’ll be surprised to see how much liquid seeps out. That’s the liquid which, if frozen in the zucchini, would have rendered that zucchini a mushy, flavorless mess. You won’t be able to squeeze all the liquid out of the squash, of course. Just do your best. I managed to squeeze at least one cup of green, salty liquid out of one handful of shredded zucchini. I’d freeze this “broth,” except there isn’t going to be any room in my freezer. It’s going to be filled up with zucchini. And green beans. And kale. And lots and lots of peaches. For the next step, I borrowed a tip from Julia Child: Take the wrung-out zucchini and press it into a measuring cup. Empty the cup onto a 12-inch x 12-inch sheet of wax paper. 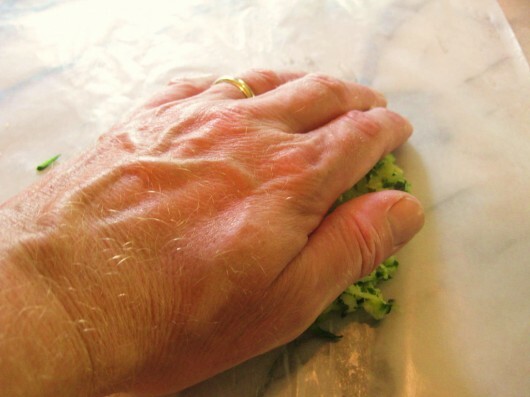 Now flatten the squash with your hand. In other words, “squash the squash.” You’ll end up with a nice round disk. 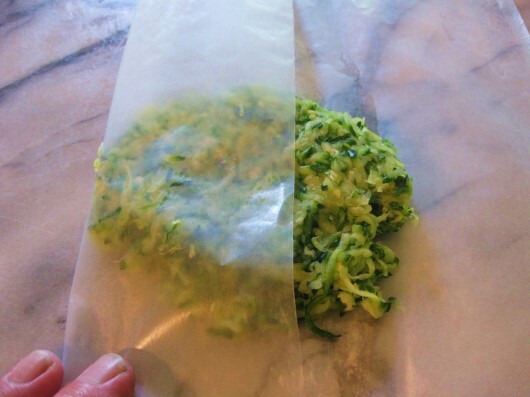 Fold the sides and ends of the wax paper over the zucchini to make a loose seal. When you are finished, the package will look like the photo above. Enclose, by the cupful, the rest of the shredded, squeezed-out squash in pieces of wax paper. When solidly frozen, stack the packets in zip lock-type bags. Be sure to label each bag as to content and date. These individually-wrapped portions will be very easy to use. If a recipe calls for “one pound of shredded zucchini,” you will know that one pound equals one cup of your frozen, wrung-out squash. And finally, here’s a question for you: Are you swimming in zucchini (or yellow squash) this summer? Thank you for this post! I had intended to Google how I might be able to freeze the zucchini! Our zucchini crop is amazing this year!! I have the worse luck growing zucchini! Last year I did get some after a couple of years of none. This year I have some beautiful leaves growing, but not a single flower/zucchini to be seen. I do have better luck growing summer squash. I shred and freeze that also and use it during the winter in meatloaves and soups. HAHA! I have that exact same towel. I am getting beautiful squash this year. Thanks for the tutorial, Kevin! Love everything you send. This is great advice. I can’t wait for the fritter blog! I am looking for a good way to freeze my crooked neck squash for the winter. I would like to slice it. Any ideas? What a great way to freeze all that zucchini we get tons of every year. I also like to shred and then dehydrate zucchini for easy storage in jars. I have even ground the dehydrated ones into powders that can be added to both sweet and savory breads ….and no one knows. Kimberly I haven’t had good luck freezing sliced crookneck squash, it turns to mush. But you can freeze it shredded as Kevin shows with the zucchini. Squeeze the be-jezus out of it. I think it contains more water than zucchini does. SKV – Glad to hear the freezing-tutorial was helpful to you. Now you can enjoy your abundance…in January! Terry – Some years zucchini does nada around here, too. Good that your yellow squash is producing. Sue Wein – You obviously have excellent taste in kitchen towels. Erin – Fritters coming soon. I have to test the recipe a few more times…as insurance. Kimberly – Terry in comment # 7 is right — when frozen, sliced crookneck squash will turn to mush because of its high water content. But shred it, drain it, and wring it out — and it will freeze beautifully. Thanks so much for the great info on how to store squash. I’ve sliced it and frozen it before in an attempt to spread out the bounty, but it’s only suitable for soups or casseroles. The shredding and salting is an idea I will definitely try. I partially cook my yellow squash like a stir-fry and freeze. I saute a sliced onion and minced garlic in the slightest amount of either butter or olive oil to not quite a limp state. I often put the lid on, to help them sweat down so I don’t have to add any water. Then add 4 – 8 yellow squash, sliced in coins, depending on how big your squash is and also your pan. If the squash have gotten large, I quarter the larger end. Add about half of the salt and pepper you would usually use, and 1/2 tsp of thyme, marjoram or basil and quickly stir fry or saute until the squash is almost tender. I then let it cool just a bit, and using a slotted spoon, put in freezer bags or seal-a-meal bags, in the portions the two of us will eat. When we want a quick vegetable in the winter, we pop it into a bowl and microwave. By the time it is heated through, (you may need to use a fork to break apart some of it), it is ready to eat. Or, I can just put a bag of it into my soup. Any liquid that has drained off, can either go in soup, be frozen in small bags to be used in soup in the winter, or simply discarded. Our whole extended family loves the squash this way, too. We never boil it as most people do. Where do you find time to do all your gardening/cooking/freezing? Wishing for a slower paced life and more hands-on time with fresh food… someday! Sorry, I think I missed something. How would I know that one pound equals one cup of frozen, wrung-out squash. Is that just “one of those things” that I should take on faith or do I have to shred a certain amount of zuchini?? Amy – Zucchini plus Parmesan cheese equals heaven! Thanks for the baking sheet cleaning-tip. Judy – Yep, the shredding/draining makes all the difference. Zuke has a similar texture to pasta once it’s been drained. Yummy. Linda – Thanks for the slicing/sauteeing tip. JD Pence – Ah, that is a good question! It helps that I arise at 5:00AM — if not earlier — every day, 7 days a week. Kelly – One pound of squash is equal to one cup of shredded squash. I verified this a few times by weighing some of my zucchini before processing. Julia Child and others came to the same conclusion. As always Kevin, you timing is spot on! I let a zucchini get away from me and decided to shred it and see if the chickens like it. While carrying it out to them, I tasted the shreds and it was terrific! Reminded me of hash browns before cooking. I wondered about adding beaten egg some bread crumbs, seasonings, and onion and then pan frying. Then gave it to the chickens, and they could care less :). Cracked me up. And now here you are with your fabulous freezing technique and promise of fritter post coming up. Cannot wait. Thanks again, so much! I’m going to have to buy mine at the farmer’s market.! Mine bloomed only male flowers and then the borers “got ‘ it. Oh well ,maybe next year . or maybe I’ll try another one still. My zucchini crop has been nothing this year. Maybe I’ll still get some, but I’ll save this great article for next year anyway. A blue and white check towel with fleur de lis works best is hilarious! You have a way with words!!! I actually have one of those and it’s ALL I’ll use. A red and white one with stars would just not cut it! I have been reading your blog for awhile and it is great! Love it. You are so creative. I have a bumper crop this year as well. I’m going to try your method as a last ditch effort. In the past I’ve tried blanching then freezing (not good), sauteeing then freezing (better but still mushy) and this year I’m also trying dehydrating. That seems promising , but I’ll also do some your way for the fritters and for a gratin that I do in a non-stick frying pan and add shredded cheese at the end, stir to combine and melt, then run it under the broiler until brown. Thanks for the idea. Swimming in them!!! I thought I only had two but they and yellow squash are now overwhelming. Or I should say they were or at least they will be frozen after your wonderful advice and my handy dandy food processor get to work today. By the way a 9 cup food processor is the only way. I had a smaller one and often recipes would not fit. Last summer I got one at a garage sale for $10 still sealed in its box, unused. The only catch was that it had a European plug, but, I have the adaptors. It is now my favorite in the kitchen, used almost every day. I had my own garage sale and sold my old smaller one for $10. The shredding attachment is wonderful because by hand it is a real challenge for my arthritic hands. A wonderful Xmas present for anyone out there with a loved one suffering from rheumatoid arthritis. Thank you Kevin a perfect chore for today. I don’t trust skinny cooks either! Thanks Kevin, I will give this a try this afternoon. Making Sweet Pepper Relish, Pineapple presearves today. So this squash should tuck in nicely while everything else sits. Popped some of the yummy pineapple into the dehydrator to use in scones. Question: Do you rinse the zucchini once it’s thawed to get out that salt? Or does most of it come out when you squeeze the juice out? I don’t trust skinny cooks either. Thanks, Kevin, for the best tutorial I’ve ever read on freezing zucchini! Wrapping 1-cup measures of both types of squash is a huge plus! I even make a yellow squash pie and use it as a dessert! I am so happy to know I can freeze the yellow squash using the identical method! You have made one reader very happy today! I always look forward to reading your latest blog and learning new information! One of these I am going to try one of your yummy recipes! Yellow squash pie??? On top of thie great zucchinie trick – WOW ! Does Amy have any more information about the baking soda remedy for cooking sheets? Thanks for a great Sunday read!!!! FIrst thing I go to on Sundays! Kim R – Almost all of the salt comes out when you drain the squash. In fact, I tasted the shreds after wringing them out, and noticed they were 1.) Incredibly delicious as is — almost like pasta, and 2.) not salty. Man oh man Kevin Ill tell you this couldnt have come at a better time! Im up to my earlobes in zucchini bread and soon the entire neighborhood is gonna be knee high in squash! – Soak 2 pounds of black currents with 1 quart of 13 1/2 or 14 degree red wine for 3 days in a cool place, stirring every day. (Use the fruits as is, with stems and even a few leaves won’t hurt. Matter of fact it adds a bit of character to the liqueur). – Crush the mixture in a food processor. – Strain to remove seeds and pulp as best you can. – Add 1 pound and half of sugar to the liquid and bring to a simmer for 1 minute (not to a boil). – Strain again with a finer strainer to remove the remnants of seeds and pulp. – Bottle in a pretty serving bottle with a cap or cork. Will keep non refrigerated for one year. Enjoy especially in hot summer days! I am swimming in zucchini and yellow squash. I just finished making a batch of almond flour zucchini muffins and we have zucchini and squash chip processing away in the dehydrator. Thanks for your tips on freezing zucchini! Perfect timing! Thanks for the tips! Oh, and I’d like to sign up first for the food processor in advanced! Thanks! Thank you so much for this advice! And I agree with Paula, perfect timing!! The zucchini & squash are coming in fast and furious; and I do want to be able to save some for the winter….you know, those ultra snowy upstate days when you long for a summer memory 🙂 Nothing like pulling out your harvest then and thinking of those days over something freshly baked :)!! I LOVE your advice on freezing peaches too; and shall be venturing out to a farmers market this week in search of some!!! Thanks for the freezing tips. My favorite zucchini recipe? Add the shredded stuff, plus a tablespoon of chopped onion, to regular pancake batter. Fry and top with Parmesan cheese. I can’t get enough of this! What would you have done with the squash juice? I have never seen Zucchini shredded with the skin on….that is what I’m seeing in the picture….Yes? Seems that would be much easier to do it that way. Thanks for the freezing tips. Hope to try them out myself soon! I now have 8 1/2 c. Of frozen shredded zukes/yellow squash in my freezer, thank you very much! Waiting with bated breath to find out what the leftover juice can be used for as my 8 1/2 c. Shredded yielded 7 C juice I now cannot bear to toss. I have lots of room still in my brand new freezer ;). These yields are from 7 yellow squash and 3 zukes, around 10″. 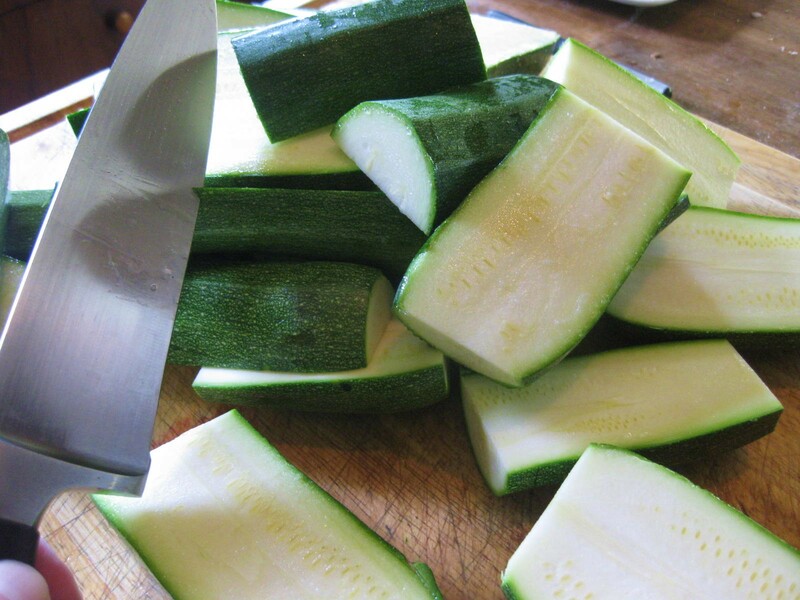 I slice Zuccini lengthwise 1/4″ slices salt and weight them. Make Lasagne and use in place of pasta then freeze for later…….never gets soggy…..awesome. perfect fresh also! I love zuccini fritters, so I will be trying this method. Your blog is fantastic! Ange – Yes, I leave the skin on. Krystal – You can freeze the zucchini “broth” separately, and then use it for winter stews and soups. Amanda – Kudos to you! Cleo – Zucchini lasagne=good idea! Ellen – Why, thank you! Thanks! I am blanching chunks of yellow squash right now but will use this idea later! Thank you for sharing your knowledge. I am learning so much. I have been gardening for several years but have just recently gotten into trying to preserve food–beyond tomatoes which I water bath can. I used to give away so much produce because I couldn’t use it all and didn’t know what to do with it. Thanks so much for this new method. I just gave this a try today. I use sea salt rather than kosher and it turned out wonderfully. I grabbed the top pan in my drawer which turned out to be my large pizza pan and with all its holes, made for a very quick freeze of the individual portions. 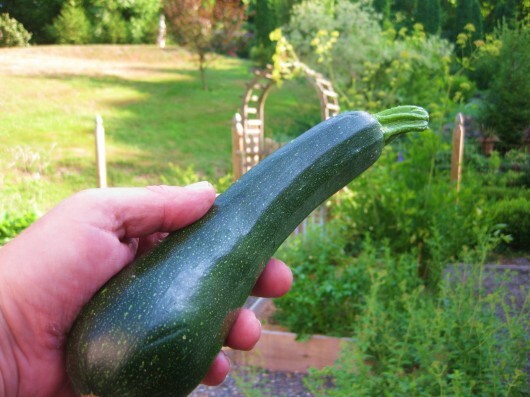 Amazing how much water there is in Zucchini–I decided to save mine. Can’t wait to read any ideas as to how to use it. Any salt left in the Zucchini is virtually undetectable, so I won’t hesitate to use it in anything. Hi there Kevin, happy tuesday. I love this zucchini trick for freezing and am about to make my mountain of squash into molehills of frozen stuff this afternoon. I have a couple of questions i hope you can answer. 1. I don’t own a food processor and will be grating my zukes by hand. In your instructions you use a 9 c. capacity processor and 1 tsp salt. Does this mean the correct ratio of zuke to salt is 9 cups shred and 1 tsp salt? and question 2., do you think i can do the same sort of process for cucumbers that i would like to save for wintertime tzatziki? I really really hope so as i just cant eat any more this week, I’m going to start looking like a cucumber. 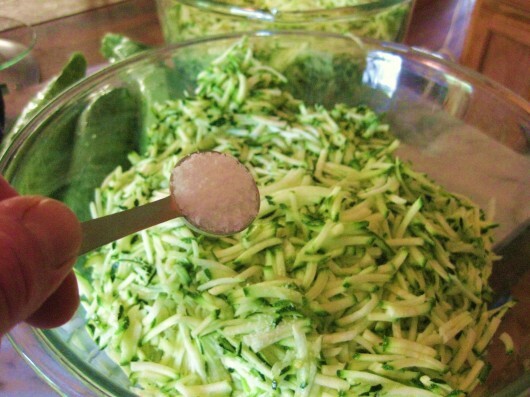 Hi Martha – Use one teaspoon salt per pound of zucchini. One pound is equal to about 2 medium squash. As for cucumbers…I’ve read numerous reports which state they must be pickled before freezing. Here’s one freezing-recipe. Have fun with your preserving-projects — I know what it’s like to be overwhelmed with garden produce! I have a question. If a recipe calls for 2 cups of shredded zucchini would my fozen 1 cup size still be equal to a cup of non frozen zucchini? My plant has produced way more than I can even give away! I love zucchini bread and want to freeze some of my harvest for winter bread making. Hi Bernie – Can you tell me a little more about the recipe, i.e., does it ask you to drain the shredded zucchini? thank you for this, Kevin! I am swimming in zucchini this year, my first time growing it and love it! I am in the process of following your instructions right now and they are wonderful! Kevin, I’ve finally had a chance to shred (by hand!) all the zukes and prepare them the way you described — I can already see how much better an approach this is than the past, when I just shredded and dumped them in freezer bags, getting mush later. Thanks for the tip! Kevin, it is just your basic zucchini bread recipe. It just says 2 cups of shredded zucchini. Hi Tammy – I admire you for hand-grating your zucchini. What a workout! Hi Bernie – I’d go ahead and use the one cup of shredded, drained zucchini to the bread recipe. Should be utterly delicious. I learned a trick for onions from a local organic gardener. Probably easier with pictures but alas I have none. But, hang a loop of good string from a hook. Put the bulb of a well dried and cured onion through the loop and twist the dry end around the string. Continue layering around and around and up and up and looping to the length of onions you want in your line. Tie the string off next to the last one, leaving a hanging loop. Hand in your cellar or pantry and cut onions off as you need them over the winter. Interesting amounts because I’ve always understood that 1 lb. equals 16 ounces (2 cups). 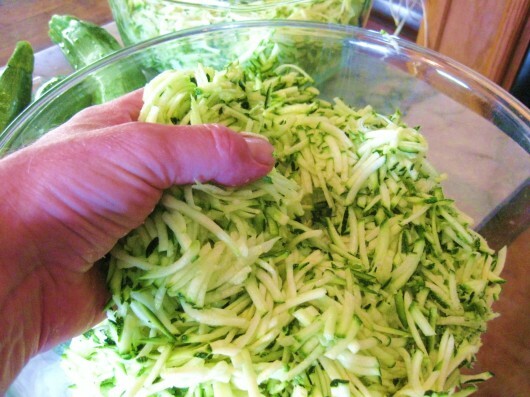 I made zucchini marmalade last week and ‘googled’ how many cups of shredded zucchini were in 6 pounds. The results on Google said 12 cups. Maybe I should have researched this further. Thank you for your tip on freezing zucchini. It has been so hot here with the temp in the mid 30s for about 3 weeks so I didn’t fancy blanching them and heating up the house even more. I had six plants come up but only one is really producing and I pick at least 3 zuccs a day. I have given away as many as I can without being a nuisance so I’m looking forward to having a grating session today. Thanks for the tip. In past years I froze it as was and you’re so right – a mushy mess. Our zucchini is doing great this year and we are joking about having our daily zucchini to keep up. Your method of freezing zucchini if the squash bugs and weather don’t do my plants in this year will be one that I try. However, I discovered I prefer freezing in glass jars way better than plastic bags. Not only does it keep better, it tastes better. You just have to be careful not to fill it too much. Our zucchini are starting out very slow here in Southern Ca. Can’t wait to freeze it for bread at Christmas! Thank you! Growing lots of catnip for the kitties and the tomatoes are starting to turn red. Can’t wait!! Kevin and Joan Louise, please don’t mistrust ALL skinny cooks! I am slender (a much kinder word, no?) because my organic garden is 1/3 of an acre and I do it all by myself, from starting seeds indoors to putting up all my produce for the winter. It’s alot of work! I do it because I love food, hard work, and being outdoors. And I love your posts, Kevin! Thanks. What perfect timing for this! Thank you! I’m sure my zucchini will freeze and taste better with these steps! My zuchs are not large enough yet to produce blossoms. But this is normal. I don’t care for zuchini bread, it is too darn sweet. But there are many other tips here I have not tried. Cannot wait to use the squash for lasange noodles! I will also try the dehydrator tip, I dehydrate evrything else why not zuchini. We had a little freezer mishap this past fall and have had some interesting flavors in our food……evrything, and I mean everything has a slight huckleberry flavor. Huckleberry flavored elk steak, huckleberry flavored hamburgers. So that’s what I did wrong! I didn’t salt and squeeze. If i manage to get any zucchini this year between the late, late spring and the cooler than normal weather, I will be trying out your method. I have a wonderful recipe for zucchini bread that I usually make as muffins. They freeze really well in muffin form. It’s more work, yes. And being a vintage shredder, it’s sometimes a challenge to operate for more than a minute or two. After many years of trying, last year was the first time I ever got any zucchini! And there was lots, like it was trying to make up for all the failed plantings. I loved making bread and butter pickles, but this will help with all the rest! Interesting ideas and comments. Like that you explained that this doesn’t necessarily leave a “salty” product. Personally I don’t mind eating the mushy, blanched/frozen zucchini; which isn’t to say I prefer it. But my wife won’t eat it straight (has to be in pasta sauce, stews and such). She does however more thoroughly process (liquify) zucchini, pumpkin and bananas for use in bread/muffin making (one reduces the liquid ingredients somewhat)… and I love the more moist results. Oops! She just read this over my shoulder and exclaimed I’m giving out her bread making secret. “A blue and white towel decorated with fleur de lis will work best.” LOL. I like your style, Kevin! Anything with a fleur de lis works the best always. What about freezing it in slices for sauteeing and breading??? Clean, slice, wrap, bag, and freeze? The baking sheet cleaning with baking soda/peroxide absolutely and positively DOES NOT WORK. Google it and you’ll see. You’ll just have to use good ole fashioned elbow grease if you want them spiffy or just buy new ones or use parchment paper every time you use them. Do really really like the baking sheets made by USA Pan. Never get gunky and nothing sticks to them and bake super super evenly, as well, no burnt cookig bottoms ever. Off to buy Zucchini at Farmers Market. Thanks so much Kevin, and I’m also hoping that you will post something on freezing peaches. I have never had luck with whatever I’ve done, and peaches are my absolute most favorite fruit! You could mix these with bread crumbs and seasonings and they would be ready made zuke fritters ready for frying in a touch of olive oil. I am growing yellow zucchini this year. Do you think they have more nutrition? And don’t forget national sneak some zucchini onto your neighbors porch day, August 8th. Everyone is supposed to drop off huge unwanted zucchinis on peoples door steps anonymously, early in the morning. Myra – Love the August 8 idea! Kevin, I just got on the computer and wanted to look up how to freeze zucchini, and BAM, I found you. Thanks. My mom use to freeze it, but all I remember is that she shredded it. I didn’t know about adding the salt and squeezing water out. I’m sure she didn’t, but I am sure from my experience, it would be very necessary to do. Thanks for a great site and keep up the funniness, love it ! Great ideas everyone. One quick thing to do with slices of the huge boats is to slice size of english muffins, top with pizza sauce, and any pizza ingredients, broil for 5 minutes, nice and crunchy. and we found that if you only have one zucchini plant that you wont have babies…not sure how that works..I have the biggest plants of my life this year in friend’s garden. P.s. I moved a couple times so my old food processor would be great but I have no patience to assemble the parts, I decided to be untrustworthy and grate with the old faithful grater and get exercise. My first wedding Christmas was that gift, I LOVED it. If a recipe calls for 1 cup of shredded zucchini would I use 1 cup of the frozen? It seems to be more per cup then fresh. I totally forgot to add salt to my shredded zucchini before I wrung out all the juice–do you think that will be a problem? I packaged up 6 cups worth before I remembered. Thanks! If you rise at 5AM, I’m curious as to when you hang it up for the day and go to bed? What can be done with the “broth” (juice)? Just finished my first batch. Kind of scared at the amount of juice!! Am freezing the broth in baggies as well, since we just bought a second freezer and have plenty of space (at this point ). Will be trying your easy pickles tomorrow, as soon as a few more Kirbys get a little bit bigger. Very glad to have found your sight. Enjoy the tours, and my wine! Thanks so much! I’m posting this to my blog, I tried this last night and it worked wonderfully. Looking forward to zucchini in the winter! Kevin … I’m so pleased to have found your site. Absolutely wonderful; thank you!! We grow lots of zucchini each year and give lots away too. This last season I found how to make ‘zapple’ which is zucchini cooked with lemon juice as a substitute for apples. It is one of the very best recipes I ever had the pleasure to find. Next crop I shall make and preserve heaps (I hope ..lol) to use when I run out of apples. I also use the bigger ones (baseball bat size) to make bread and butter pickles … lovely on crackers! Jan Bee — Nice to meet you. “Zapple Pie” sounds awesome! We love to eat fresh and smaller zucchini with tomatoes, onion and garlic cooked in butter. It is so good. Wondering if I can just slice and freeze the zucchini for the recipe. I just hand shredded and prepared it with the salt and squeezing. Sure do like your recipes. Thank you for the good advice. Help, I forgot to drain my shredded zucchini. Is it possible to thaw it, drain it, and refreeze it? Or should I just leave it? It is solid frozen but I can tell there’s frozen liquid in it. Will this destroy the zucchini? Hi Deb – At this point, I’d leave the squash alone. Next year you’ll know to drain it first (for best texture and flavor). Thank you thank you thank you!!!!! 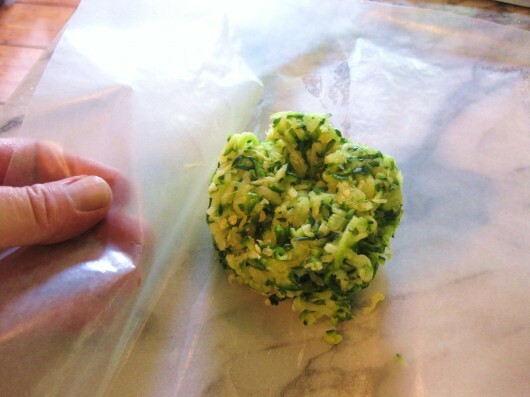 I love you for showing how to do this sensible, flexible and much more useful version of the “how-to freeze zucchini”. I want to use zucchini as a pasta substitute and needed a way to preserve some. Making patties is brilliant!!!!!!!!!!! How do I freeze sliced yellow crook neck squash? I would like to have some to fry in the winter? This post is awesome. I never thought to measure it out in patties or even to squeeze the excess moisture out. Brilliant!!! I usually just end up with a frozen clump of zucchini. Not any more. I have frozen zucchini before but didn’t use much of it. I can only eat so much zucchini bread. I am waiting for recipes to see if it is worth the trouble. Brandy wine tomatoes are ripening here in KY.
Kevin you mentioned flash frozen for one hour. Don’t you need special equipment to flash freeze or was that just a figure of speech. Thanks for the great tip. Here in Sierra a Vista, AZ we got one yellow squash and no more. Will try again earlier next year. Hi Michelle – By “flash” freeze, I simply mean to freeze the packets in a single layer. I’ve corrected the wording in the directions above. I’ve been doing this for years! in the winter, I throw a bag of it into soups, stews, chili etc (without bothering to thaw) and the zucchini ‘melts’ into the mixture, slightly thickening it up and adding tiny green flecks. 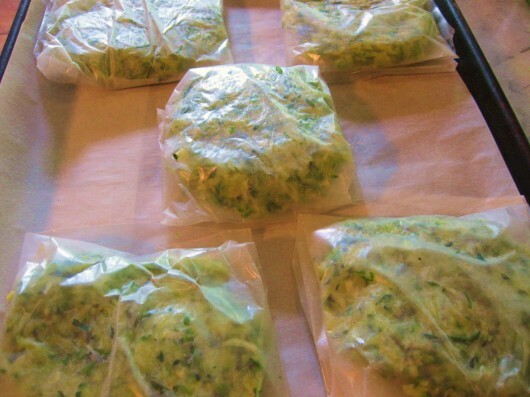 I will definitely start freezing zucchini Thanks for sharing your method! Thank you, Kevin so much for your tips. I just put my first batch of zucchini in the freezer. It was so easy. This is my first year for square foot gardening in Missouri. I’m having so much fun, despite the bugs, with it. The produce is beautiful, tastes delicious and it’s been very therapeutic. Question: have you addressed freezing green beans, your preferred method. And, English cucumbers. I do juice so that helps, but I’m having a hard time catching up with them. Kevin, thanks for the info on freezing zucchini. I worked on about 8 pounds of the green gems last night and I used a salad spinner instead of a towel to get the liquid out. Worked like a charm. I just wanted to share. Where did you buy your shredder? 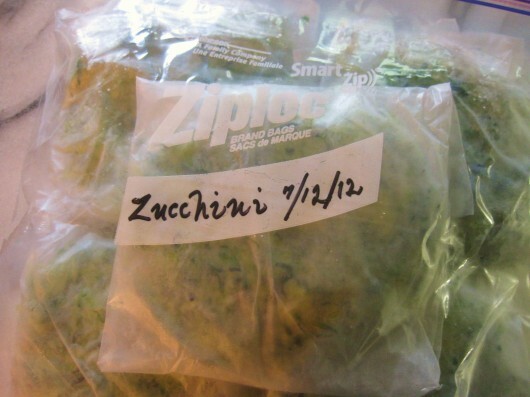 When using the zuchinni, do you have to use less salt in your recipes because you used salt when getting it ready to freeze. Just wondered about that. I have a huge patch (probably 5X8 ft!) of yellow squash and Zucchini that just VOLUNTEERED from last year….SO I put a small fence around it and have picked quite a few of each so far….. I freeze my shredded zucchini mostly for making zucchini bread during the winter ( when zucchinis $ 1.79 / lb in the store). Since my recipe depends upon having the moisture and flavor of the zucchini juice as part of the recipe, i do not squeeze it out – just bag it up as is-shredded, and without salt, and label the bag “3 cups zucchini ( what my recipe calls for. ) However, I can see where if you are going to make fritters or some other recipe where you want the zucchini to be fresh, or at least fresh-looking, the salted and squeezed-out zucchini would be better. 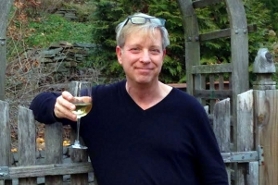 Kevin~I absolutely love your website and look forward to it weekly! I will be freezing my zukes today, but also have a question for you…I have a brand new dehydrator, and if I use it for slices of zukes and yellow squash, will they cook up good in casseroles or will they be “rubbery”? The casseroles call for cheese and crumbs and egg and sour cream…I just hate mushy or rubbery squash…LOL! Many thanks! Blessings~and keep up the great work! Kevin, One pound of shredded zucchini equals one cup of frozen squash? Is it that dense? My zucchini have just started coming in so perfect timing on this.. I won’t be freezing for a little while… have lots of recipes I want to try first but knowing that soon I will be over run and burnt out on them 🙂 Thanks bunches. 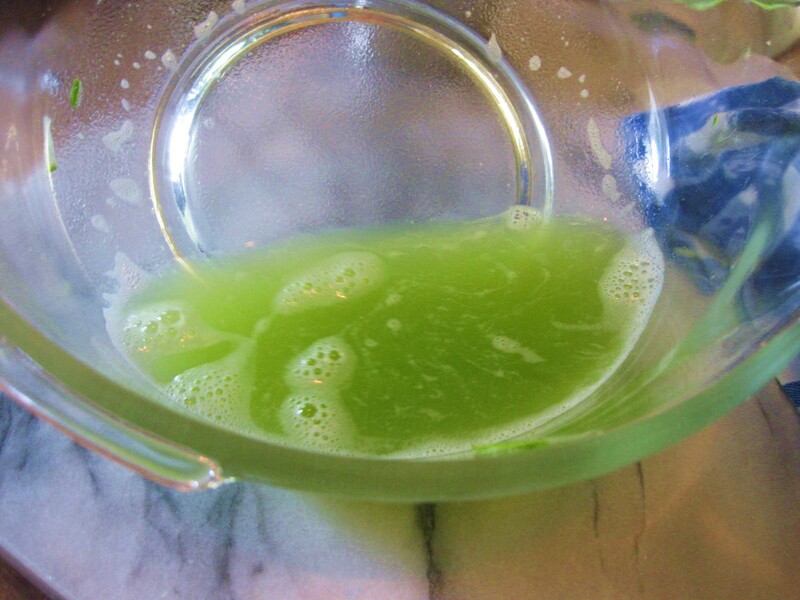 Any juice coming through vegetables is the best filtered water there is, so use it some way or other, no? Thanks Kevin and all who posted such wonderful info and tips! I always learn a lot and cannot wait to open your newsletter on Sunday morning! So can you go a step further and make these with your zucchinni fritter recipe (will that freeze?) all ready to plop into a frying pan? That would be handy to pull out of the freezer. Also when I got back from vacation I saved exactly 3 emails out of the 2206 In my inbox. Yours was the 1st one I saved! Awesome idea..I hate soggy zuchinni and until now the only way I knew how to hide it. Was to grind it and hide it in spaghetti or chilli. Now maybe I will try zuchinni choc. Cake or bread.,even the fritters! My plants have just started to produce and already have more than we can use. Two plants! Thanks for another great tutorial! I’m wondering if this would also work for beets? My late mom used to freeze shredded beets, but I was never around and don’t know if she par-cooked them or not…any advice? Overgrown zucchinis: Zuccanoes! Slice in half lengthwise, stuff as you would green peppers, top with your favorite shredded cheese and bake. One canoe apiece! Never thought to freeze zucchini! TY! 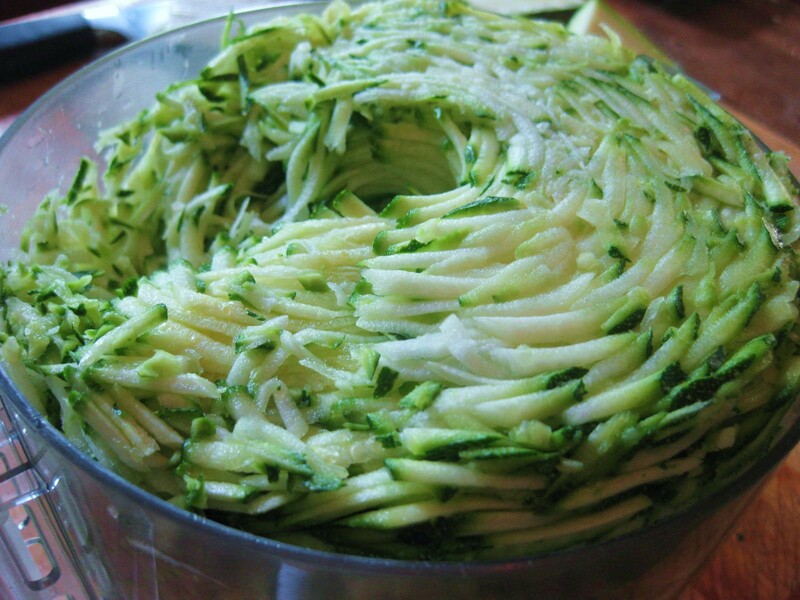 Farmers Market Zucchini…spiralized zucchini is a new favorite this year. Now I will freeze it using your technique!! 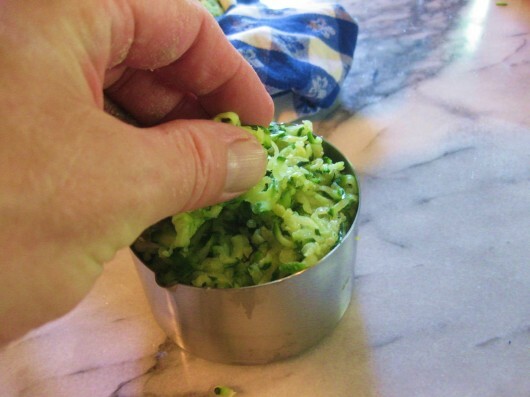 I measured the shredded zucchini before salting: 12 packed cups; after salting and squeezing: 6 packed cups–next time I’ll weigh the before and after but I’m sure one cup drained is one pound…we’ll see! Enjoyed this site. Our one plant is fading after producing nicely. Do you think I could plant seeds and get squash in September? We do have butternut plants growing. We get 30-40 in a season. They keep all winter. Since I don’t have much strength in my hands, instead of wringing the summer squash or zucchini out with a towel, I used my salad spinner and it worked like a charm, plus I didn’t have to use as much salt to dry it out first. Hi Kevin. Love your writing style! I followed your instructions and also the tip from a reader and used my salad spinner to get the excess moisture out. Also, I let mine soak in a large, over the sink strainer, so it leeched quite a bit of water that way as well. (Plus, I didn’t have any blue and white fleur-de-lis towels, so I had to improvise.) Anyway, I weighed everything (because my Weight Watcher scale had to be used for SOMETHING) and I started with just over 6 pounds of pre-grated squash and ended with just under 4 pounds of squash patties. I used the one cup measure as advised by you (and Julia) and weighed those as well. They each weighed between 7.8 and 8 ounces, so one cup of grated squash does NOT equal one pound of grated squash. But, whoever heard of a recipe that calls for a weight of grated squash? Usually they ask for cups or fractions thereof. This has gotten longer than I anticipated, so I will end here with a huge thank you for the idea of grating and freezing my zuc “patties”. Now I can wait and bake in the winter when I actually feel like turning on the oven! On to the beets! I just froze three ‘cups’ of de-juiced zucchini. Now, if my recipe calls for 2 cups of shredded zucchini and all I have is the frozen ones, how many of the frozen should I use? If I use 2, won’t that be 2 pounds?! Thank you for all your help. Blessings. After thawing, my zucchini looks white (rather than green) – is this normal and is iit ok to eat? 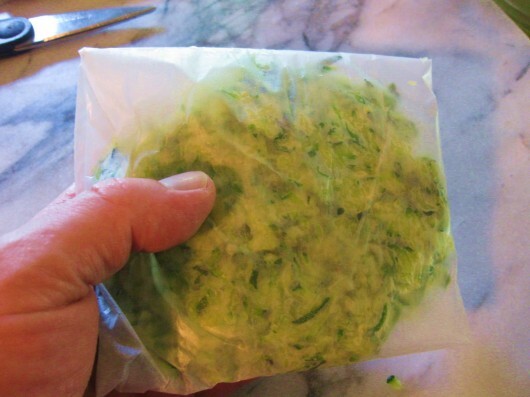 Yes, getting lots of zucchini this year and have used your method for freezing for a couple of years now…works great! Wanted to ask if you have tried spiralizing your zucchini to make “zoodles” aka zucchini noodles? My vegetarian daughter got me started on these this year and they are fantastic! Would love some ideas for using them…also wondering how I might freeze them. Thanks for the always terrific blog! Thanks again, Kevin! I didn’t plant a garden this year, but I’ve definitely stored this away for reference for next year. May have to visit my local farmers market now! And thanks to everyone in the comment section for your tips! I’ve found the easiest way to do this is to line your slow-cooker with parchment paper, and I haven’t found it necessary to use the tea towel trick if you’re wondering. The texture won’t necessarily be the same, a bit denser and more moist, but my husband loves them. Also, it frees up your oven if you’re doing a whole lot of cooking at the same time. Just be warned, the cooking times for newer slow-cookers are much faster than for the old ones. I’ve done this successfully with carrot cake and pumpkin (squash in our case) bread. Will have to try zucchini bread now! Hi Kevin…I discovered many years ago that a potato ricer does a great job of squeezing the water out of zucchini and spinach. It sure makes the jobs go alot faster especially when there is alot to freeze. Still have zucchini in freezer from last year’s bountiful crop. It’s now gotten to the point that I can almost hear the neighbors saying, “Close the curtains, Mabel, here she comes again.” Yesterday a local theatre director showed up on my porch with a script for which he wants me to audition, and he ended up with a bag of zucchin thrust into his hands. Never miss an opportunity to foist zukes on the unsuspecting. He also walked off with peppers, cabbage, onions and garlic. You neglected to mention what a workout it is for your arms! Amazing how much liquid squeezes out! #116 Linda asked the same question I have…. Excited to try freezing zucchini. How long does frozen zucchini last? Can I use the same method for yellow squash? Thanks. Hi Lucy – As mentioned in the first paragraph of this post, the above freezing technique works for yellow squash, too. Frozen squash will “keep” for at least 6 months. Have fun with your preserving project! Have you tried this method with freezing zoodles instead of shredding them? I only have table salt. Is that OK to use instead of Kosher salt? Do you have to add the salt part? Will the salt affect the flavor once it is thawed later on? Thanks! I use a salad spinner to get the water out of squash and cabbage. 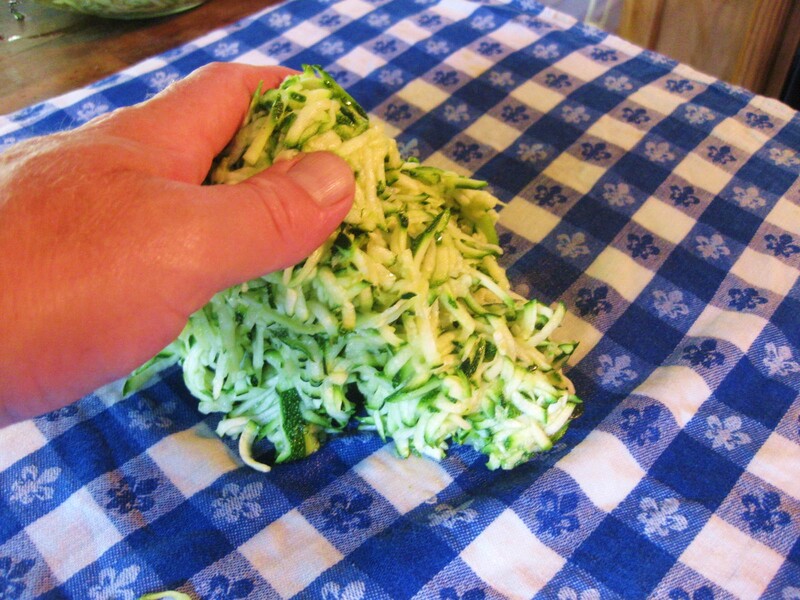 I am wondering how much 1 cup of “wrung out, pressed down” zucchini equals to fresh shredded zucchini in recipes? I’m guessing it’s equivalent to like 2 cups? What a refreshing bit o’ Sunday, when I open and read your posts! Thank you so much. May you delight in every bite of zucchini anything you ever make. I will salt and squeeze my zucchini this year (maybe even on my blue – but no fleur de lis – towel) before I freeze it! My 2 zucchini bread recipes use 2 cups of grated zucchini, fresh. Decided I’d try to freeze some to make it in the winter as I’m overwhelmed with produce at the moment. After I squeezed the liquid out of the 2 cups I’d grated, I had one cup of shreds. How do I account for this if I make the bread with the frozen shredded zucchini? Should I save the liquid, frozen separately, and add it back in when baking the bread? Should I use 2 cups of the frozen zucchini? Or should I just not use it for zucchini bread at all? I used cheesecloth (the real stuff, butter muslin, not the stuff at the grocery store) to squeeze out the zucchini. I got a tremendous amount of water out this way. Oh I needed this! My coworker grew multiple inch zucchini this year! The huge ones make lots more juice but otherwise worked the same! I will search your site, but can you elaborate more on use of the broth in soups? Just one zucchini got ne about 16 oz of juice and I would hate to throw it out! Hi Jess – The zucchini liquid is quite salty. If you freeze it for winter-time soups, broths, etc., just remember that you (probably) won’t have to add any additional salt! And P.S. 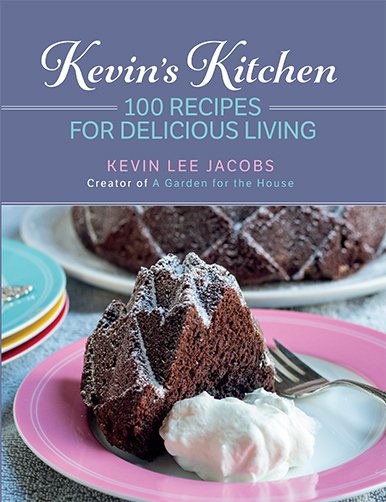 : I made a video of the freezing technique here: Kevin Lee Jacobs Delicious Living. I followed these instructions and froze 6 one cup packets. I’m so excited! Thank you for such a clear and easy way to store up zucchini for the future!! I’m going to do several more batches.